With only about 200 people diagnosed each year with fibrolamellar, the disease is as rare as it is mysterious — there are no known causes and it's difficult to both detect and treat. By the time doctors discover a growing tumor it is often too late, and the cancer has spread. "We reasoned that it would be easier to identify genetic mutations in the tumors of young patients than in older ones, because in older people, the genome has been altered by years of aging and environmental factors," says Elana Simon, a co-first author on the study and a member of the Rockefeller team. "Both the person as a whole and the tumor itself will have had less time to accumulate mutations, so those that we do find are more likely to be relevant." 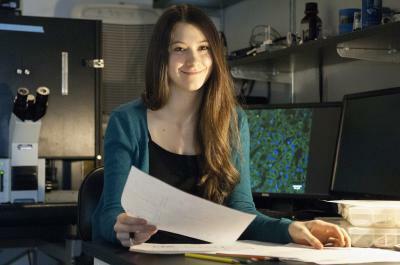 Elana Simon is shown in the Rockefeller University lab where she conducted research on fibrolamellar cancer, the same type she was diagnosed with six years ago. "We discovered chimeric RNAs in the tumor samples — made when DNA deletions create unnatural products that can drive cancer," says Nicolas Robine, co-first author and NYGC Computational Biologist. "This chimera had never been seen before, so we believe it will help drive the work of our Rockefeller colleagues and Elana's future. It is the NYGC's mission to undertake such collaborative genomic studies that will accelerate medical advances." "Because of the deletion and then rejoining of the DNA, a new gene that was a mixture of two previous genes was created, called a chimera," says Elana Simon. "A number of other types of tumors have been shown to be driven by chimeras, but this one is unique — it codes for a kinase, an enzyme that modifies other proteins, that has not been identified in cancers." Furthermore, the researchers found that the kinase was made only in the tumor cells, and that it was constantly active. They believe that overproduction of this kinase may explain the uncontrolled growth of the tumor. "These results were extremely encouraging," says Sanford Simon, the study's senior author and head of Rockefeller's Laboratory of Cellular Biophysics. "It is uncommon for a genetic screen for a cancer to turn up such a strong candidate mutation, and for the mutation to be present in every single patient tested." 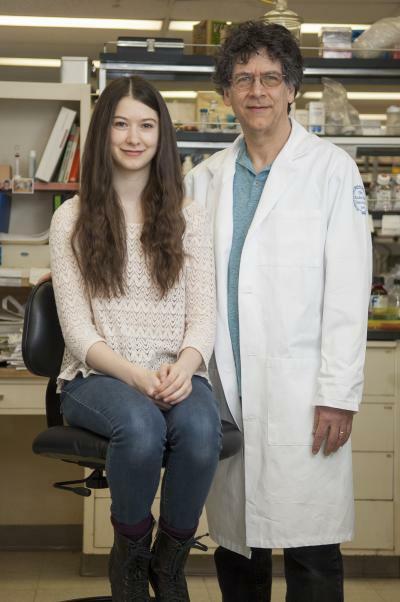 Elana Simon is shown with her father, Sandy Simon, in his lab at The Rockefeller University. Together with colleagues, the two conducted research on fibrolamellar cancer, the same type Elana was diagnosed with six years ago. The research is also unusual in that it was funded not by a federal grant, but largely with private gifts from the Fibrolamellar Cancer Foundation and several individual donors whose lives have been touched by the disease. Additional support was also provided by the Howard Hughes Medical Institute, the New York Genome Center, The Rockefeller University Center for Clinical and Translational Science and by a gift to The Rockefeller University by an anonymous donor. The Simon lab is now working on testing the effects of the chimera on human liver cells and in mouse livers, to further elucidate its role in the disease. If they can understand what's causing the tumors to develop, the scientists can work on not only treating them — using a genetic target to halt the cancer's growth — but also catching them before they even appear. "The hope is that we'd be able to screen the blood for the presence of this chimera, and patients wouldn't have to wait until the tumors are present, until it might be too late, to do something about it," says Sanford Simon. The work may also have implications for other cancers. "Genomics is allowing us to classify cancers based not on the organ they originate in, but on the molecular changes they trigger," says Sanford Simon. "Now that we know about this new chimera kinase, we can look for it in other cancers and work to develop new tools that will someday radically improve our ability to fight disease." "NYGC is thrilled to have this work be our first published example of the explosive power of collaborations between deeply invested biologists like those in the Simon lab including Elana Simon, and thoughtful bioinformatics scientists like Nicolas Robine and NYGC team, who worked together so effectively with the tools of genomic sequencing and analysis to discover this new chimeric protein and cancer target," says Robert Darnell, head of Rockefeller's Laboratory of Molecular Neuro-Oncology, HHMI Investigator, and President and Scientific Director of NYGC. "The work done serves as an exemplar for how the power of interdisciplinary and inter-institutional genomic science has the potential to save people's lives in New York and beyond." 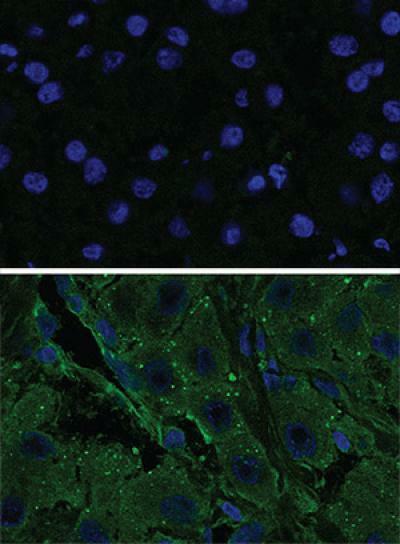 These images were taken with a fluorescent microscope show the activity of a kinase (green) in tumor cells (bottom) compared to normal cells (top). A genetic mutation responsible for the kinase was identified by a team of researchers from The Rockefeller University and the New York Genome Center.